Oct 21, 2013 Hundreds gathered at the Brooklyn Historical Society's beautiful meeting hall for a Brooklyn For Peace receptionl: Pathmakers To Peace. The event, which honored five outstanding Brooklyn residents who have demonstrated a continued effort to support the peace and justice movement both in and outside the community, was attended by a diverse community of people from all over Brooklyn and beyond. The honorees were -- Lynn Nottage -- Pulitzer Prize winning playwright (“Ruined”) and a graduate of the Yale School of Drama. Her newest play, By The Way, Meet Vera Stark, recently completed its successful world-premiere Off-Broadway at Second Stage Theatre Nancy Romer -- Nancy Romer, Chair of the Governance Board of the Brooklyn Food Coalition, a grassroots food justice organization working for healthy food access for all, sustainable food systems and justice for food workers. She co-founded BFC in 2009 and has served for four years as its General Coordinator, helping to launch the organization into its present form. Rabbi Ellen Lippmann -- founder and rabbi of Kolot Chayeinu/Voices of Our Lives, a 21-year-old progressive Jewish community in Brooklyn, N.Y. 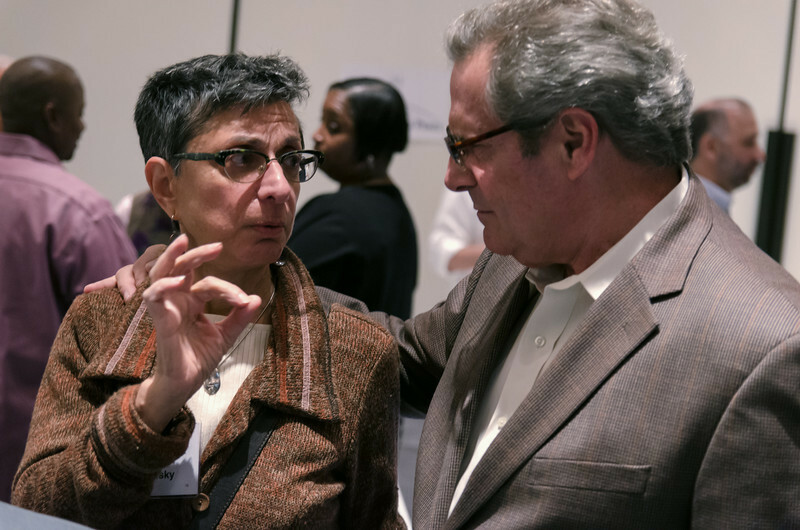 Rabbi Lippmann is the former East Coast Director of MAZON: A Jewish Response to Hunger, and former director of the Jewish Women’s Program at the 14th Street Y in Manhattan. Dr. Ahmad Jaber -- Jaber has been a Bay Ridge community member for over thirty years, Dr. Jaber is a retired obstetrician and gynecologist and currently sits on the board of Beit Al Maqdis Islamic Center, the Arab Muslim American Federation and the Islamic Mission of America, and was a past president of the National Arab American Medical Association-New York Chapter. He is currently the Board President of the Arab American Association of New York. FUREE -- Families United for Racial and Economic Equality -- A Brooklyn-based, multi-generational, member-led organization, made up mostly of women of color. FUREE organizeS low-income communities to build power to change the system.FUREE states "We fight for a world without poverty, where everyone’s work is valued and all of us have the right to self-determination. We achieve the changes our members seek by using direct action, leadership development, community organizing, voter engagement and political education." The reception also attracted local elected officials including City Council members Brand Lander and Letitia James. James, who recently won a runoff primary election and is expected to be the city's next Public Advocate, presented plaques to each of the honorees as well. This was a memorable evening that brought together friends and allies of Brooklyn For Peace and demonstrated the growing unity in Brooklyn of diverse organizations seeking progressive change for our city, state and country. Jane Kurinsky and Eric Shtob of BFP's Peace And Economic Justice committee, hobnobing before the event begins.